This is a building that can be found most anywhere - a typical store or office building that looks at home in small towns or big cities. It's perfect for almost any type of business. Built around the turn of the century, buildings of this type still line many main streets today. Includes printed interior on kit package. 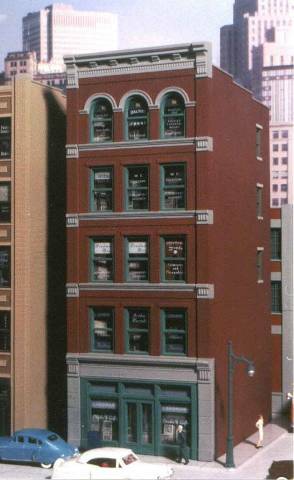 Like our #105 Baum Blvd Art Deco Building, this kit also features a unique modular front for easier kitbashing. Combine more than one for a different look that's all your own! We regret that we are unable to sell just the fronts from these kits. Don't forget our Window Dressings and signs (set 501-14) are the perfect finishing touch to this kit! For a detailed explanation of our shipping fees, please visit our Ordering Info page.